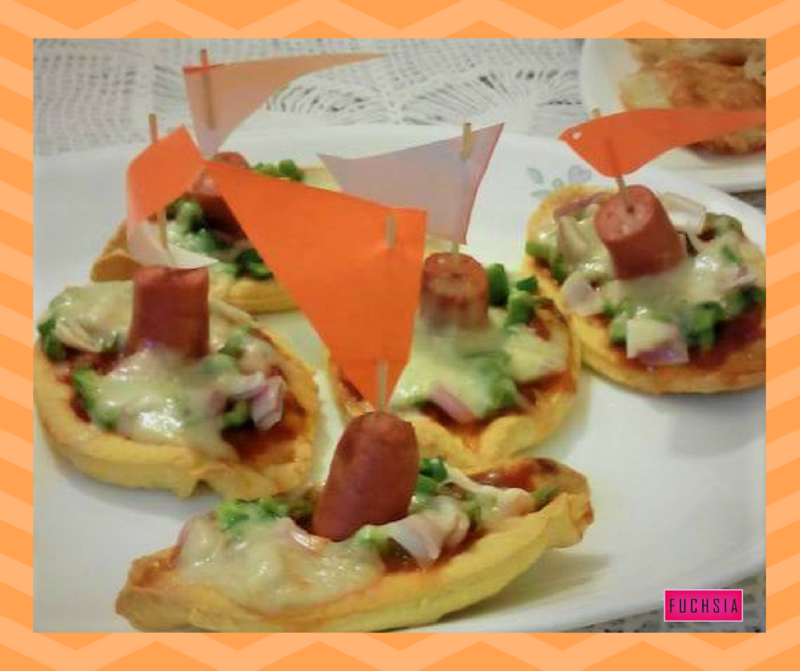 Mini Pirate Sausage ships is a recipe for children, and kids can make it too! This Recipe for Children is quick and easy to prepare. You will be making it again and again for birthday parties, tea times, and play dates! Sift flour and baking powder in a bowl and mix well. Now add melted butter, eggs, chilled water, salt and mix to make a dough. Roll out dough on a clean surface and cut boat shapes with the help of a cutter. Grease little boat shape tart tins, insert the dough inside tins , place on a baking tray and bake in pre heated oven for 12 minutes till light golden. Fill each boat with a tablespoon of pizza sauce, then lay some capsicum & onions. Insert a piece of sausage in the middle. Sprinkle some mozzarella cheese on top and bake again for 4-5 minutes. Prepare little flags from glaze paper. Insert a tooth pick and pierce into the cut sausage. Mini pirate ships are ready to eat! For more recipes, try these Paneer Cutlets at home. They’re a favourite with children and grownups! For more recipes from our valued readers for the Ramazaan Recipes contest, click here! Rubina Rafiq loves to cook and try out different recipes. She has participated in various short cooking courses, and continues to pursue her love for cooking by contributing to our Ramazaan Recipes contest! Rubina is married with 4 children.